This morning we were looking for a place to eat breakfast. We didn’t want to take the time and spend the money for a nice, sit down restaurant, I didn’t want fast food and dear husband didn’t want Starbucks or donuts. And then we had a brain storm! 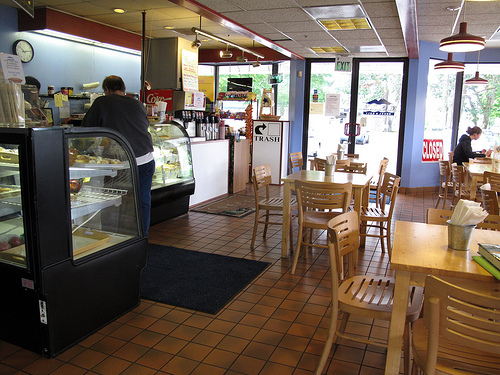 Cascade Bagel at 6115 Motor Avenue in Lakewood. We each got a toasted sesame seed bagel with cream cheese, his plain and mine garlic. They were delicious with a cup of coffee. While we were there, we also picked up a couple of bags of day old bagels. My only regret is that I didn’t ask for a tour of the cooking area, which apparently they will happily do for customers. Oh well, next time! This entry was posted in Coffee Shops, cafes and bistros, Lakewood, Restaurants, WA State - Pierce County and tagged Cascade. Bagel, Lakewood, restaurant, tour, WA on July 3, 2011 by admin.